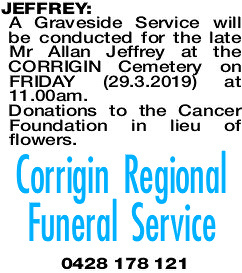 A Graveside Service will be conducted for the late Mr Allan Jeffrey at the CORRIGIN Cemetery on FRIDAY (29.3.2019) at 11.00am. Donations to the Cancer Foundation in lieu of flowers. JEFFREY ALLAN Condolences to Carol, Jimmy and Vinka, Bernadette, Phil, Sharlene, Boden and Billie and Anne on the loss of your husband, father, father-in -law, pop and brother. Deepest sympathy to Ann, Carol and families. Another Bilbarin mate gone. Peter Tulloch and families. Deepest sympathy to Ann, Carol and family. Fond memories of Allan. John's got the sheep penned up, Allan. 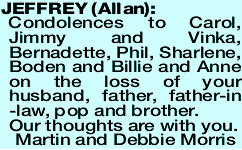 Deepest sympathy to Carol, Jimmy, Phillip, Bernadette, Ann and families. Many happy shearing memories.